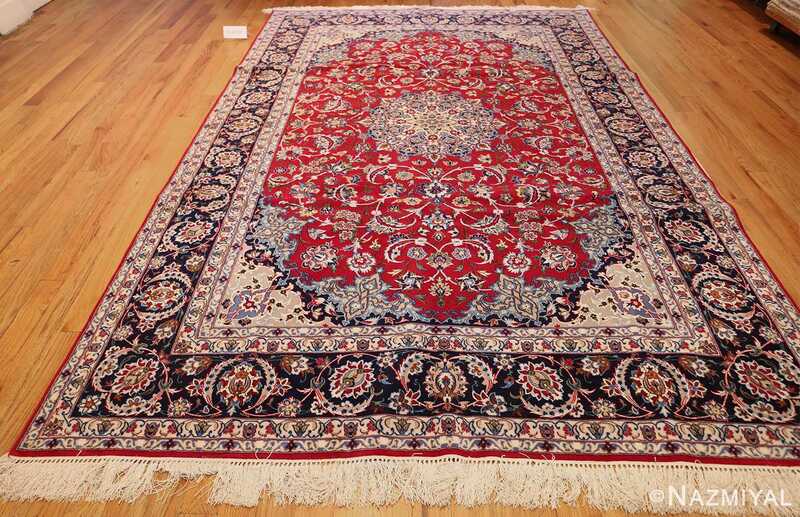 Breathtaking Fine Jewel Tone Silk and Wool Modern Persian Isfahan Rug, Country of Origin / Rug Type: Modern Persian Rug, Circa Date: Late 20th Century – The rich, vibrant jewel tone colors of this finely woven Persian Isfahan rug are sure to warm up any room’s interior decor. 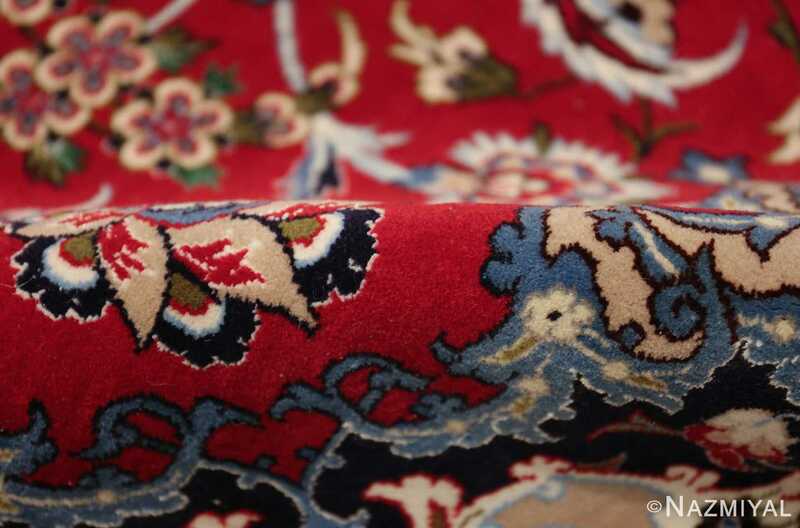 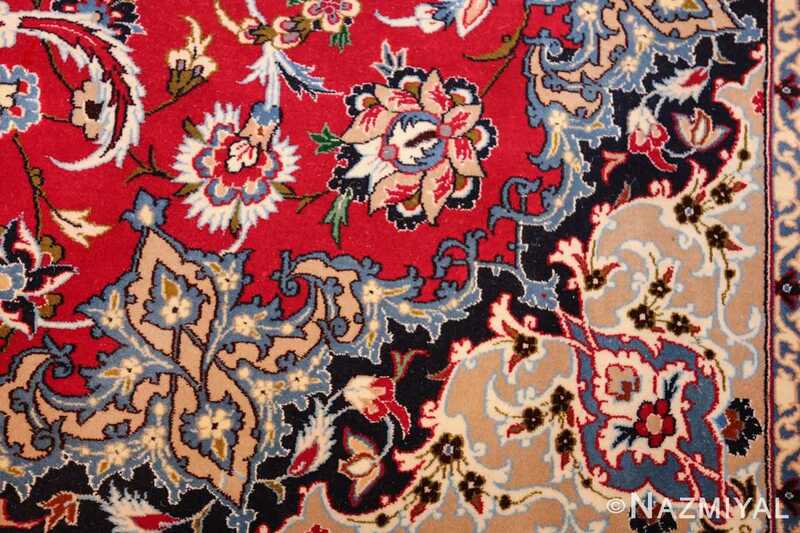 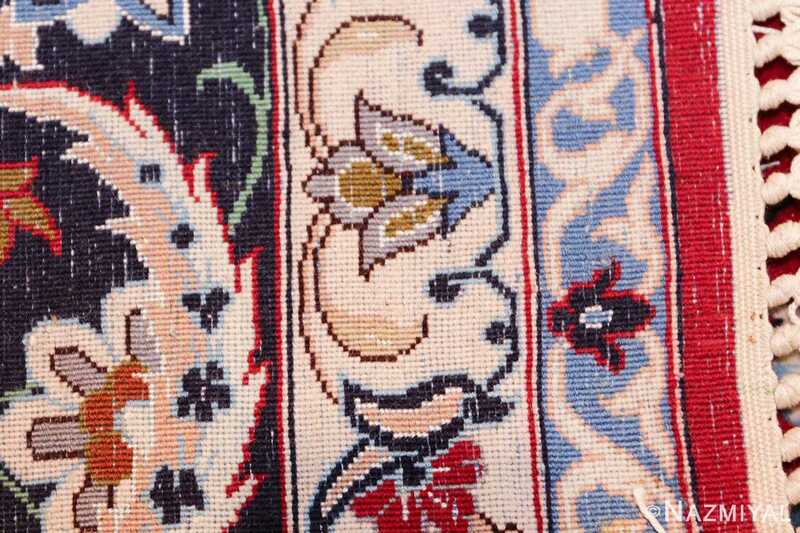 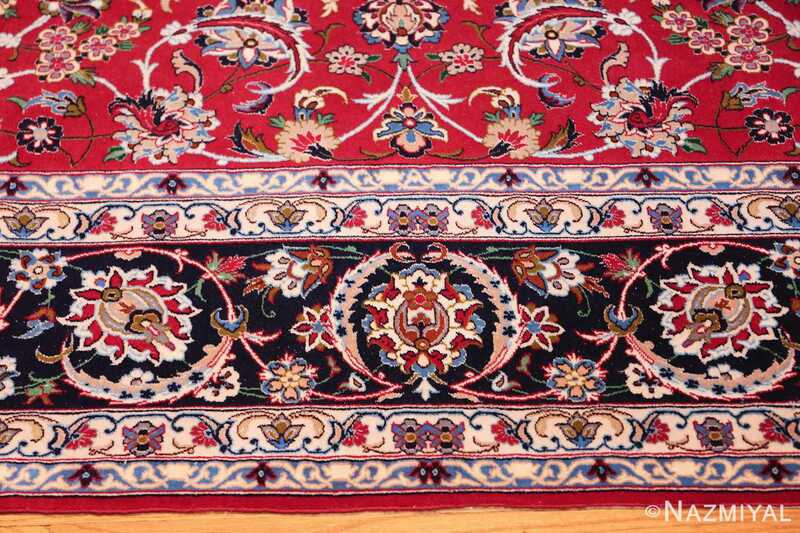 This beautiful Oriental carpet was woven using both silk and wool and the silk highlights really pop against the richer blue and red coloration. 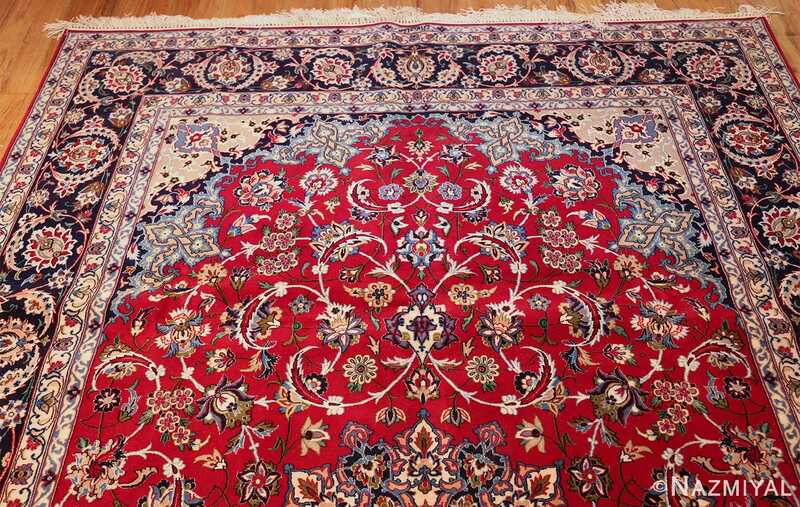 It is this juxtaposition that gives this magnificent modern Persian Isfahan rug a really fresh and updated look. 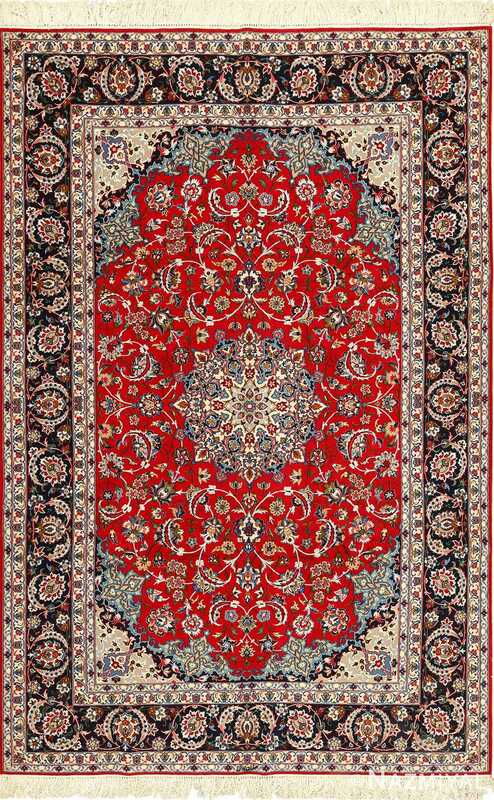 The rich red field is filled with beautifully outlined floral arabesque designs that seem to flow effortlessly. 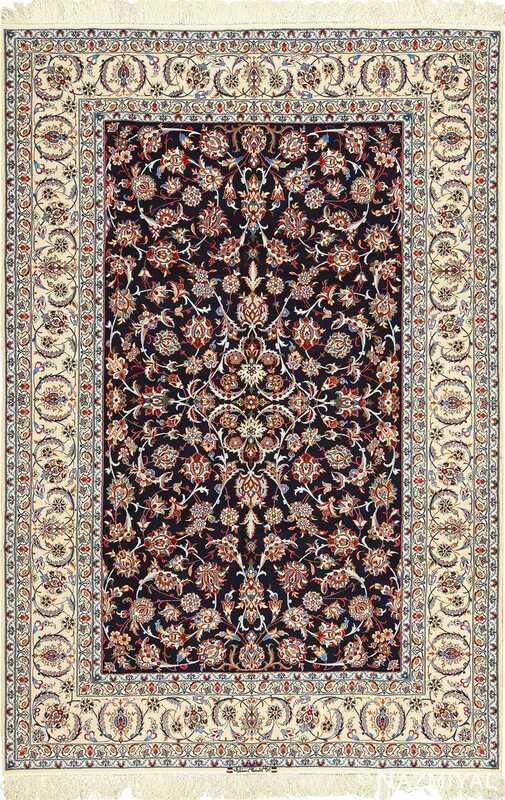 Though this rug is filled with intricate vine scrolls and floral patterns, we also see quite a bit of negative space. 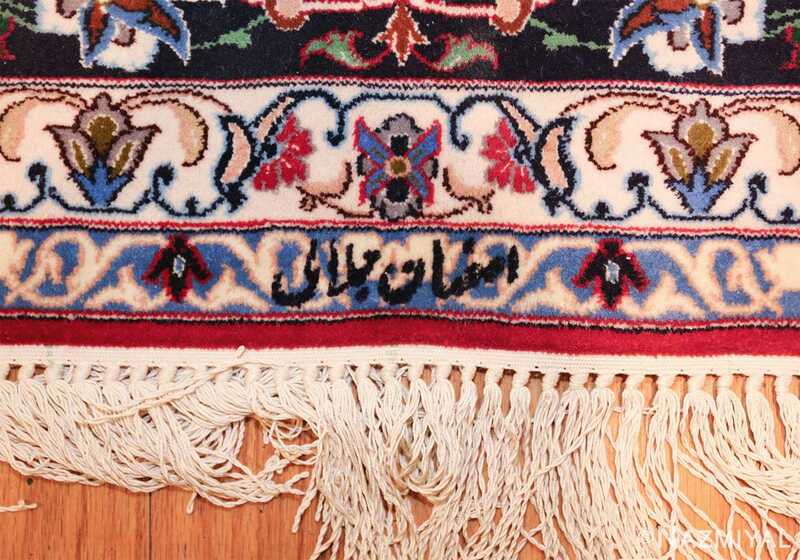 This unusual amount of “empty” spaces give this modern Persian Isfahan tug a much more open (and not “busy”) feel that we are not accustom to seeing. The contrasting cool and darker blue tones, that frame the warm red field, create a beautiful flowing sense of transition. 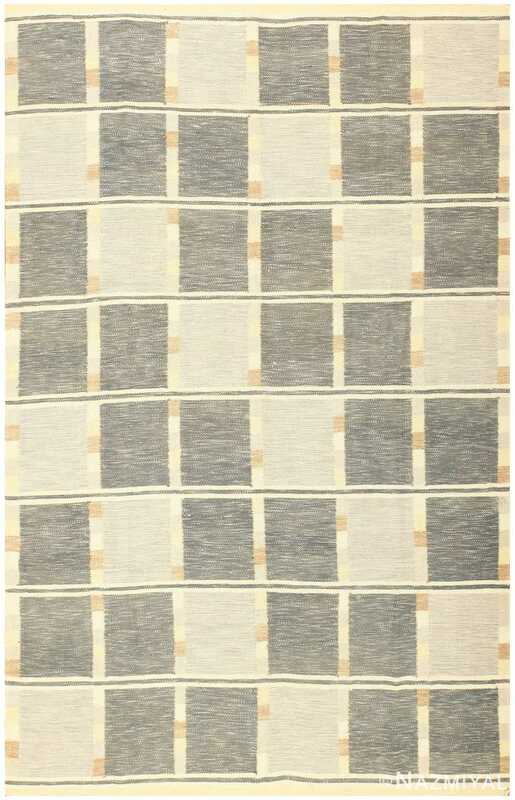 As if moving from dusk to night and back again, the stark contrast is reminiscent of the silhouettes created at dusk. 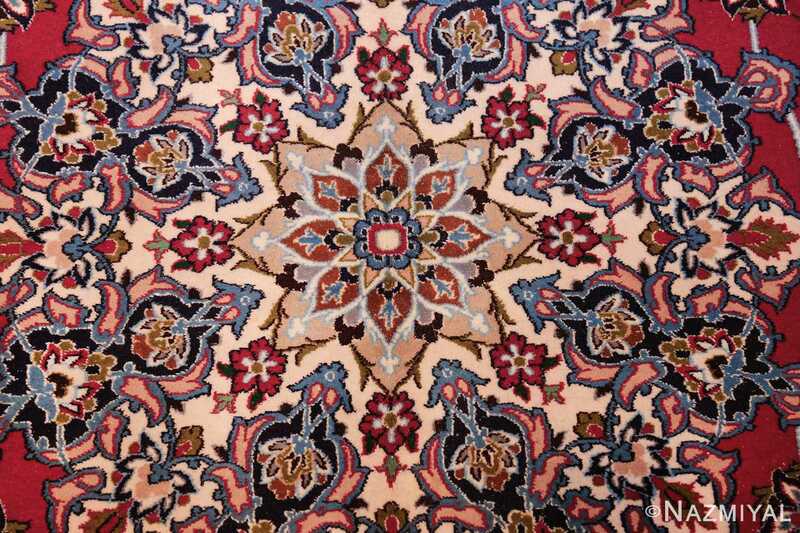 When viewed separately, each specific design element and pattern, within this modern Persian rug, is just as magnificent as the rug as a whole. 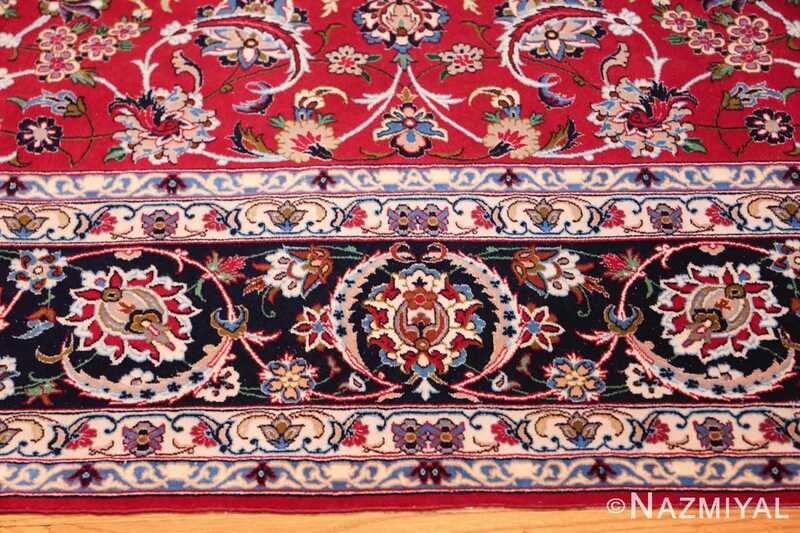 This is indicative of the fact that when this Isfahan rug was woven, so much attention was paid to even the smallest of details. 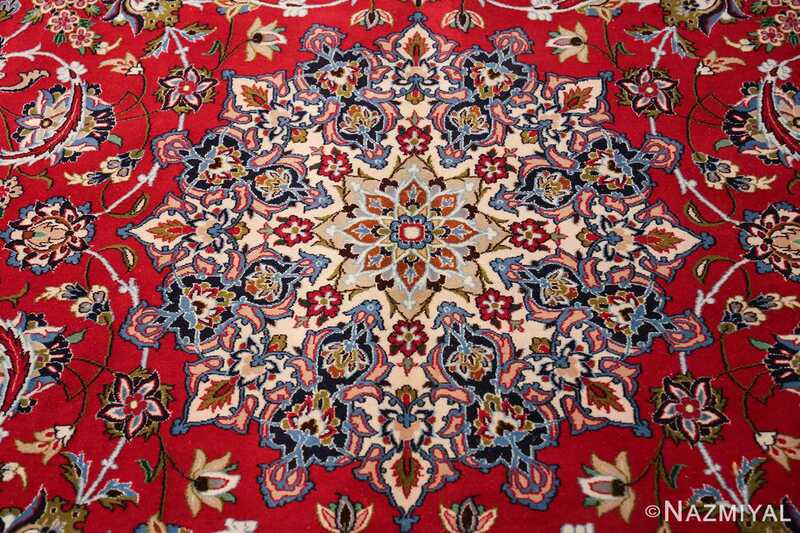 It is a known fact that the city of Isfahan has been one of the major and oldest producing centers of fine Persian rugs for centuries. This specific finely woven silk and wool modern Persian Isfahan rug is a testament to the magnificent works of textile art that these highly proficient and skilled weavers produced in the Iranian city of Isfahan. 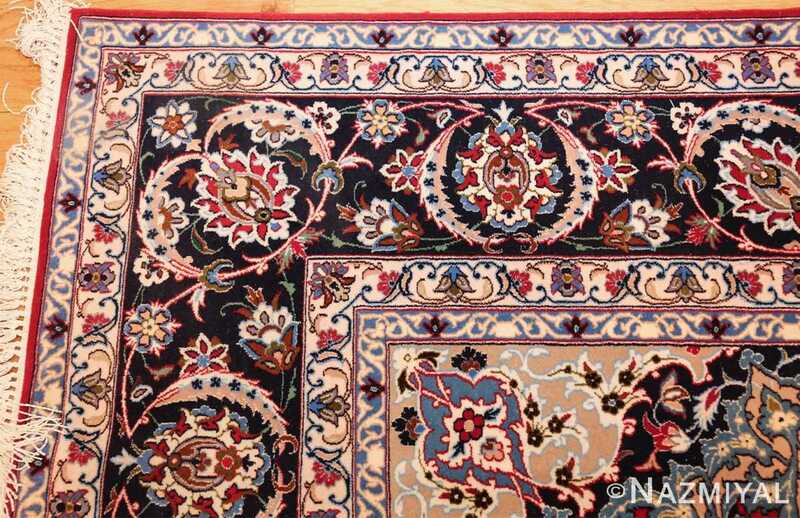 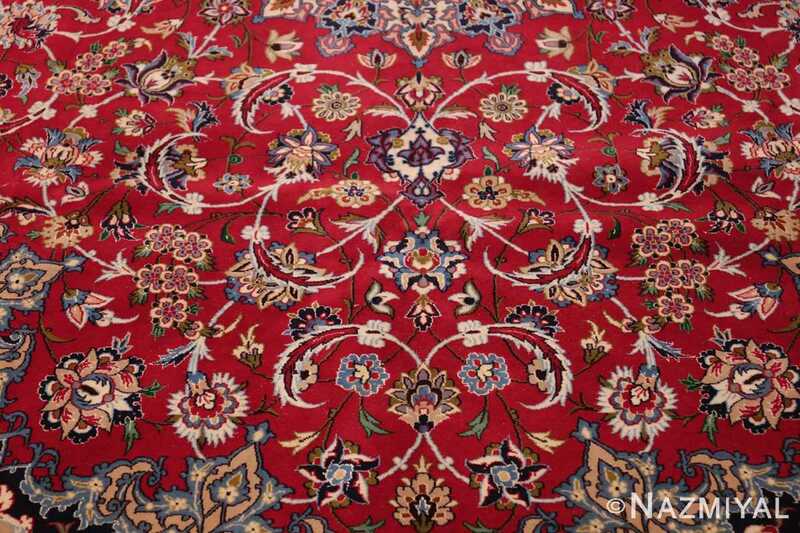 Without any doubt, the weaver of this magnificent modern Persian Isfahan rug took so much pride in their work. 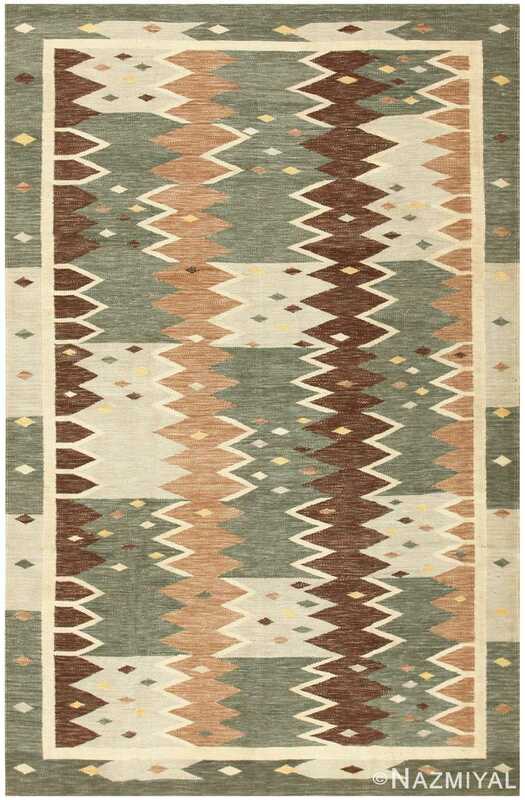 They created a rug that is so fine, you can almost “feel” the quality just by looking at.